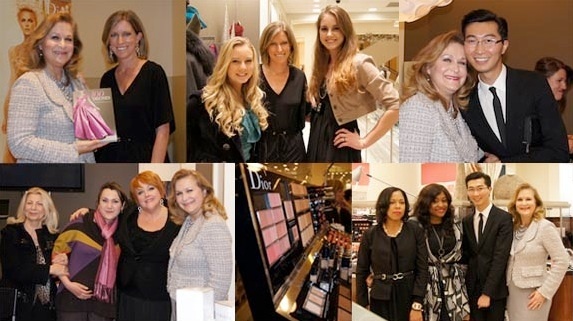 For those passionate about fashion and creating beauty, Saks Fifth Avenue in Tysons Galleria was the place to be last Thursday, December 8th, when they held Dior: Art of the Dress. The session began with National Dior Show Beauty Artists Vincent Lee and his team as they created three exclusive Dior beauty looks personalized for the attendees. 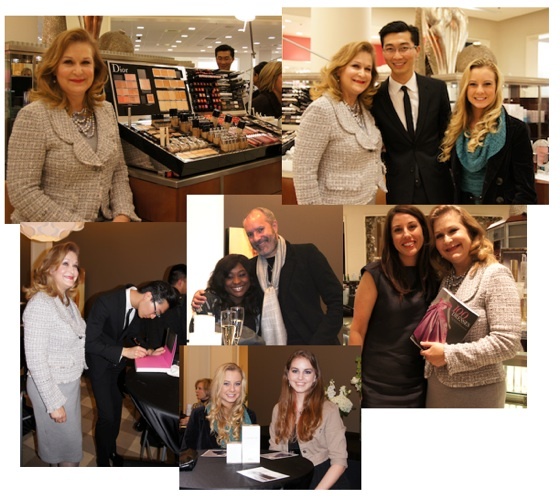 The makeup session was followed by a presentation/discussion by Vogue commentator Megan Dostal, highlighting some of the most significant works past and present from the House of Dior, and which was inspired by the book 100 Dresses created by The Costume Institute of the Metropolitan Museum of Art. 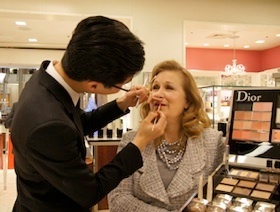 Upon my arrival at Saks, Melita from the Dior team prepared my face and then laid a light foundation for my face. After which I was introduced to Vincent Lee, who asked for the look I was hoping to achieve. To which I replied: “classic, with a hint of Catherine Deneuve.” with an eyebrow raised, Vincent nodded knowingly and said “I can see that”, and began my Cindy Ann/Catherine transformation. When Vincent had completed, I managed to catch a glimpse of myself in the mirror. And a trace of Deneuve had indeed emerged. Incroyable!! After the initial session, I was one of the lucky few to attend a two-hour master class with Vincent. Having applied makeup for the past 40+ years, it’s hard to imagine that there is anything out there you don’t already know. Yet I went in with a totally open mind, and it was absolutely amazing to see how such nuanced techniques could create such dramatic differences from what I was used to seeing. CLEANSING THE SKIN: The Key to healthy skin, says Vincent, is in the cleansing process. He recommends the Dior Cleansing Water, which cleanse and purify the skin. Your skin needs to breathe, especially at nighttime, when it is regenerating. Saturate a cotton pad with the cleansing water, and gently stroke the face. To clean the eyes, allow the pad to sit on the eyelid for 5 seconds, then remove the eye makeup. SKIN AGING FACT: Did you know that for each night you do not remove your make-up, you age your skin by 7 days? Yikes! USE OF TONER: The toner helps to bring the skin to the proper ph level (5.5). When you go without toner after washing, it takes your skin 4 hours to regain your proper skin ph level. This means your skin is working hard to get to the correct ph level rather than absorbing moisture or rebuilding collagen. DETOXIFIER: There many skin care products available but the DIOR essential and eye essential have the effect of showing from a 2-400% improvement in skin quality. APPLYING PRODUCT AROUND THE EYE: The only finger that should be used when applying product around the eye is the ring finger, since the pressure will be gentle and not injure the sensitive eye tissue. TREATING THE EYELASHES: The eyelash product that I found quite amazing was the Diorshow Maximizer, a lash plumping serum that changes the structure the lash and eliminates the need for even curling the lash and works to promote lash growth without the harmful effects of some products that discolor the eyelid. The lash color Vincent suggests is jet black, although you could wear deep colored mascara for a casual event, but this is the exception rather than the rule. To apply, using Diorshow Maximizer, push the lashes upward. The Maximizer will hold the lashes in this position. Then apply mascara. Also, after cleansing your face at night, apply the lash Diorshow Maximizer as a treatment to make your lashes grow longer. 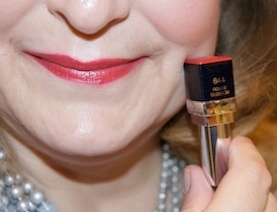 THE DIOR RED LIP RULE: Dior believed that all women could wear red lips. Hence the myriad shades of red depending upon one’s coloring. Vincent emphasized that one of the fallacies of lipstick application is to line the lip first, then filling it in with the lipstick. However, this creates a very sharp (and often incompatible) contrast between the lipliner and the lipstick. The proper method is to apply the lipstick first. Then apply the lipliner over the top of the lipstick. By coloring first and lining second, the lipliner is softened and drawn into the lip color, creating a perfect marriage of lipstick and liner. Try it. The final touch to the lips is to accent the gloss just in the center of the lip. The Dior Addict lacquer does this without leaving the lip sticky or messy. DIOR EYE LINER: Apply the liner by playing a game of connecting tiny dots along the lash line. This creates a more natural line. If lining the bottom lashes, start from the outside corner of the eye and work ONLY to the middle of the eye. You want to create an accent, not look like a raccoon. TOOLS FOR THE DIOR EYE: Be sure to press the eye color on a medium brush and apply. Blend only with the large brush. Cover the entire eye with the serum base, which is in the center of the eye color compact. Cover the entire lid in one entire stroke. Highlight under the brow bone. Crease color goes on the bone. The eye effects are achieved by the shapes and blending. 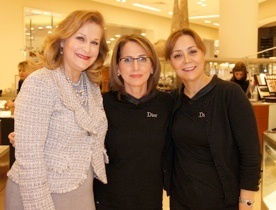 Pay Dior a visit at Saks and have them create the best look for you. DIOR FOUNDATION: Prior to my foundation, Capture Totale radiance enhancer was used to brighten and even the skin tone. Then the foundation used also had had an ever so slight luminescence. Experiment and see what your best look is. Remember, no more matte makeup! Think dew kissed. Since every brush you have has a specific purpose, be sure to invest in a good foundation brush to apply your foundation with short light directional strokes. Cheeks: Radiate from the nose out and follow the pattern of the rays of the sun. DIOR BROW: The brows not only frame the face they bring the eye into focus. The Dior Brow Styler had it’s own magic. I’m not sure how this worked, but the color worked well for all skin types. Apply in short feather strokes. 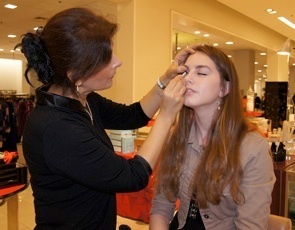 In addition, the expert brow pencil combined with the blending brush was an added benefit. After the master session, Megan presented some of the most significant works from the House of Dior, and compared and contrasted past and present works. It was here that the development of the House and its influences were particularly interesting. In the post World War II period, after years of deprivation, Christian Dior showed his first collection with “tight waists and long, full skirts”, prompting then editor of Harper’s Bazaar, Carmel Snow to exclaim “What a new look!”. Indeed, after years of restrictions and shortages, Dior offered not only a new look, but a new outlook. Among them, The Dinner Dress (Fall/Winter 1949-50). While recognized for his feminine silhouettes, Dior also incorporated many elements of menswear for his dresses. In The Dinner Dress, the black silk faille, normally found in the lapel and cummerbund of a man’s tuxedo, the black wool column. The asymmetric wrapping of the pattern pieces clearly reflects Dior’s interest in the drape of the fabric. 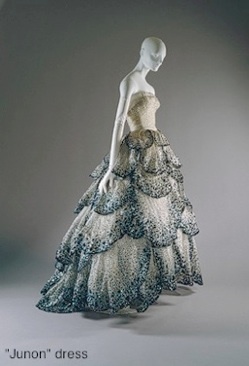 The “Junon” dress (fall/winter 1949-50) was an abstraction of peacock feathers. The magnificent skirt, created from 45 ombréed petals, each adorned with “iridescent sequins in varying shades of pale greens and blues to emerald green and navy blue, with sprinklings of rust” was one of the most coveted. “La Cigale” dress (fall/winter 1952-53) was described by Harper’s Bazaar in September of 1952 as built in “"gray moiré, so heavy it looks like a pliant metal," while Vogue called it “a masterpiece of construction and execution.” In the aftermath of World War II, American periodicals continued promoting Parisian couture lines. But in order to make their publications relevant to a wide economic range of American women, they also included American design images and the ready-to-wear lines of Paris. 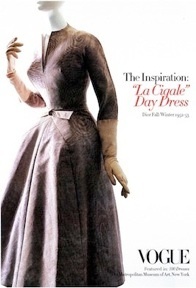 While “La Cigale” had the structural foundations of couture, its standard moiré, long fitted sleeve, and smooth bodice and skirt cut, a façade of this cocktail piece was easily be adapted for the department store, albeit with less luxurious fabrics and trims. 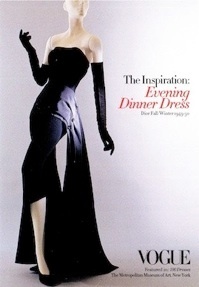 The “Y” evening dress (fall/winter 1955-56) was designed by the man whom, at the ripe old age of twenty-one, was named successor to Christian Dior after his death. 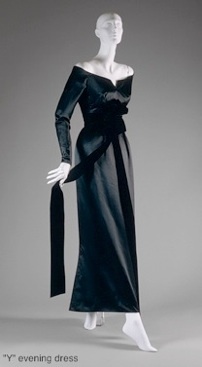 Yves Saint Laurent’s first dress design was a “simple column contrasting matte velvet with satin. The stability of the off-the-shoulder neckline was accomplished by the hand shaping of the fabric rather than by any rigid understructure”, and exemplified Dior’s minimalism of 1955. 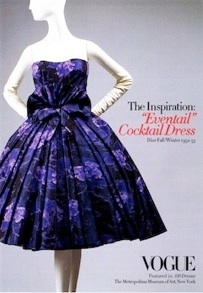 The “Eventail” cocktail dress (fall/winter 1956-57) The interesting thing about this dress, its name notwithstanding, is the fact that prior to the 1950s, it would have been rejected as an early evening dress for its strapless neckline, ostentatious constructive line, as well as its colorful surface print, given that these “various components belonged to the late evening as well as the daytime. A part of his “Aimant” collection, this was 18th century made modern. The shape “referring to the ubiquitous fans women used to ‘communicate’ at court, Dior raised the waist but delighted in the fullness of the skirt and pronounced form of the bust.” Dior no doubt would have been sensitive to the role of the fan; “The aegis and instrument of powerful and coquettish women”, it both concealed and disclosed. The rigidity of the inner structure emanates from the corset and allows the dress to be strapless. In looking back on these works, it is nothing short of amazing that in the short span of time, from the time Christian Dior launched his first collection, to the time of his death (October, 1957), he would pioneer so many innovations in the world of haute-couture. Fifty-five years later, Dior remains a couturier primus inter pares. After the Megan gave her presentation, Vincent used three of the Dior dresses as inspirations for the faces he had created; 1) La Cigale Day Dress, 1952-53 with lady-like polish perfection, 2) Eventail Cocktail Dress, 1952-53 with refined and playful elegance, and 3) Evening Dinner Dress, 1949-1950 with show stopping drama. Three of us were used as his models to compare and contrast the different looks. While modeling the Dior face a woman said that I had a look of Grace Kelly. It was such a divine evening! 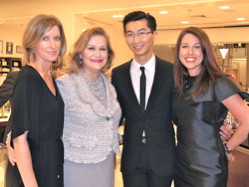 The evening of Dior: Art of the Dress with Vogue commentator Megan Dostal and the creation of Dior Beauty Artist Vincent Lee was a lovely experience. Making new friends and learning about the fashion greats, what’s not to love? Stay tuned for my future article coming out in the new year: What in the World is Couture? Cheers, here’s to your best style. Do everything with Style, Grace and hint of Catherine! à bientôt! !